Rock'n'Roll meets Sports! You'll be looking great in every situation with the new Sweat College Jacket. This jacket combines authentic look and super soft but at the same time thick quality. Finally all Rockabellas could find the right sweat style - which definitley looks fantastic! This jacket is made from high-class and heavy quality with nice details. The rip-quality at neckline and hem is very thick and strong, which prevents that it'll wear out too much. The rip cuffs are contrasting in two colours. Take a look at the big chenille patch an left forepart! It's in contrasting colour too and made of high quality. The contrasting Rumble59 Sportswear Label at neck and hem as well as the contrasting corded ribbon at inner neckline with handstitch detail completes the picture perfectly. Get this Sweat College Jacket now! It's available completely without any dare! Originally, these jackets were called Letterman jackets or varsity jackets. 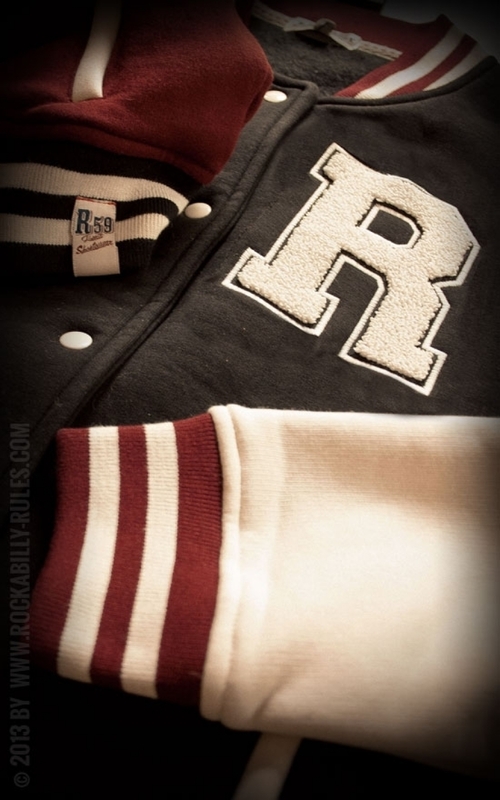 The expression "letterman jackets" stems from the tradition of high schoolers or college students wearing the initial letters of their school or team on their jackets. At some colleges, the students had to earn their jackets by test of courage or other special achievements. Sehr schnelle Lieferung, Jacke passt wie angegossen und ist super cosy und bequem! Jederzeit wieder!!! Super Jacke, angenehm weich, sehr schön. Werde sie mir definitiv auch noch in anderen Farben bestellen. Nur dann eine Nummer kleiner. 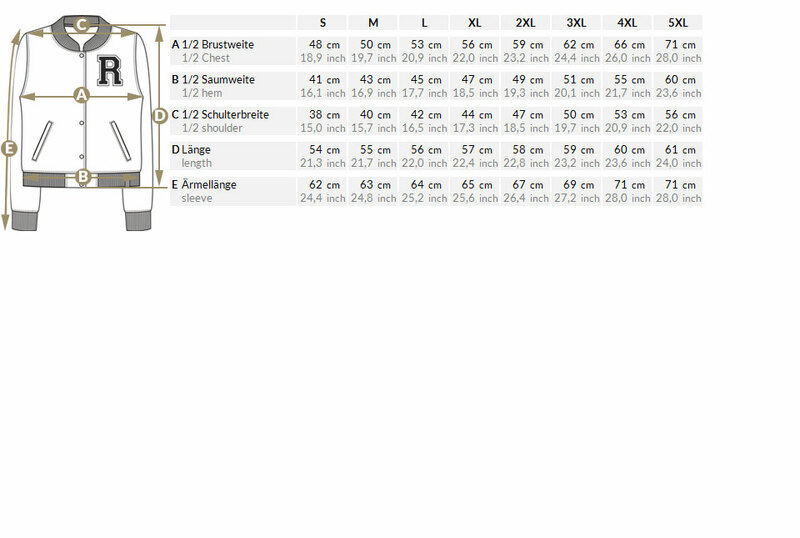 Ich trage größe 48 und habe mir die Jacke in 4xl bestellt, sie ist nicht viel zu groß, sitzt nur etwas lockerer. 3xl würde für mich aber auch reichen: Trotzdem werde ich die Jacke behalten, ich liebe sie.